My intentions are genuine but when your hobbies are the same as your job, it’s hard to tell the difference between the two. I have been very fortunate where I work that we have remained busy and since the very first of the year, I have been unreasonably busy and have not taken on any additional “hobby” projects (sorry blog but you are still a hobby). So while it might not be developing very quickly, I am still thinking about the Modern House Challenge. Which brings us to today’s topic – site built windows. The house I live in has site built windows and despite them being over 50 years old, they still look good and work great. There are some size/ design issues that I have with them but from a functional standpoint, they work as good today exactly as they did 5 decades ago. 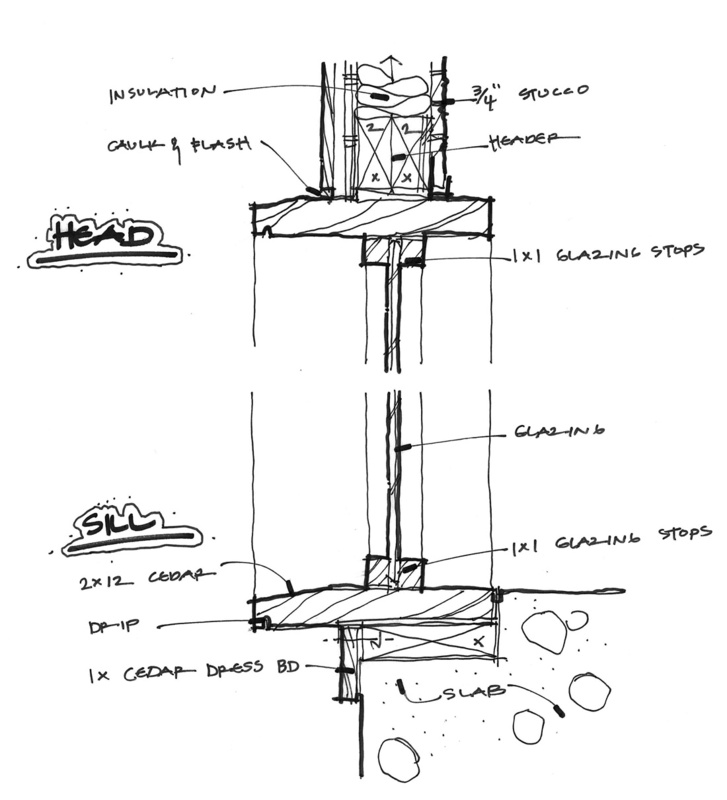 I think this would be a cost effective item to incorporate into the Modern House Challenge so I sat here and sketched up some of the details used in the construction of my windows as consideration for use. Site built windows can be extremely cost effective while providing clean lines and large expanses of glass at a fraction of the cost of the traditional out of the box window that you might get from Marvin Windows, Pella Window, Anderson Window, etc. Don’t get me wrong, those window manufacturers all make a superior product to a site built window but we aren’t talking about a large drop off for a non-operational window. 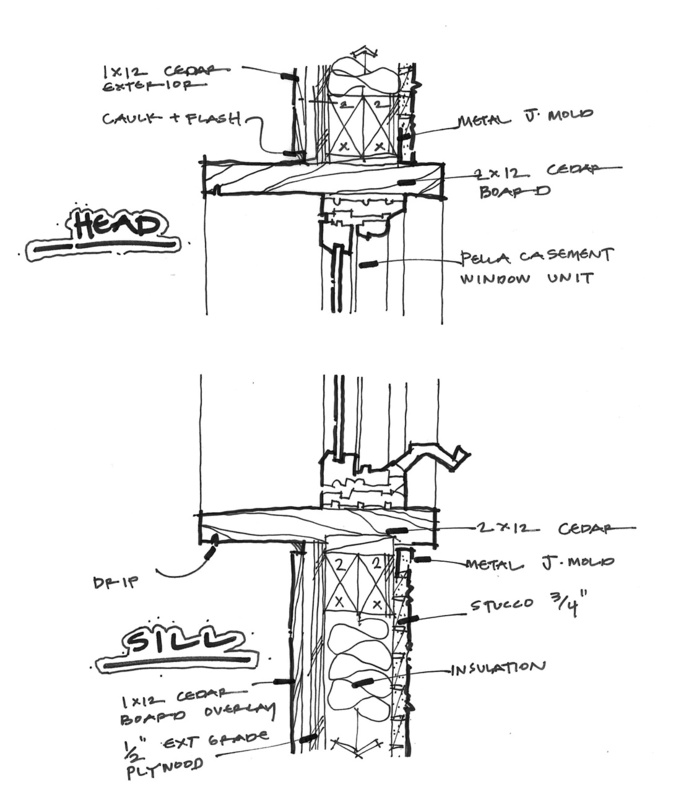 In fact, one of the details I’ve sketched up is the window in my kitchen – which is detailed out like all the other site built windows but was designed to take a Pella casement window in it. This is the assembly in my kitchen – sorta. I didn’t sketch in the counter top but rather took the generic site built window detail and modified it in a similar manner to allow for the Pella casement window. 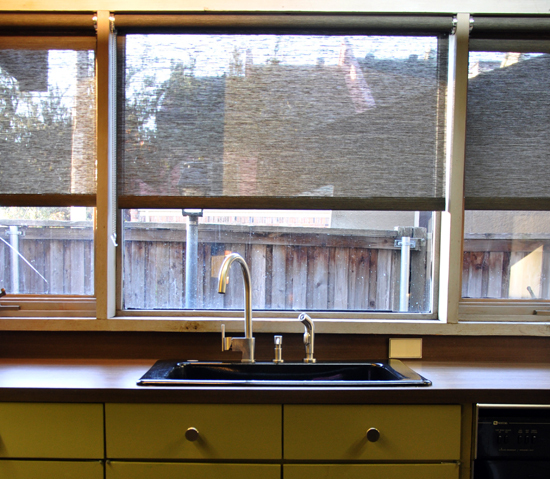 And here is the actual kitchen window. This is actually the only operating window in my house. I am bursting at the seams with sliding doors but operable windows are a different issue. This is a section through a typical window. While it might not be the best photo, this is a picture I took for a different post that shows this detail in built form. 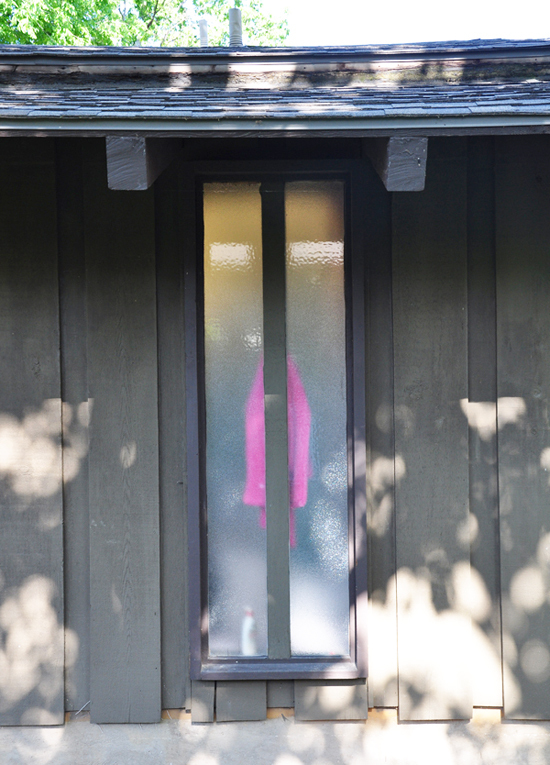 This is the window into my daughter’s bathroom (hence the obscure glazing). How you like that pink robe? That’s just how we roll playa … holla! Lastly, this is a section through the main set of windows heading out to the backyard. 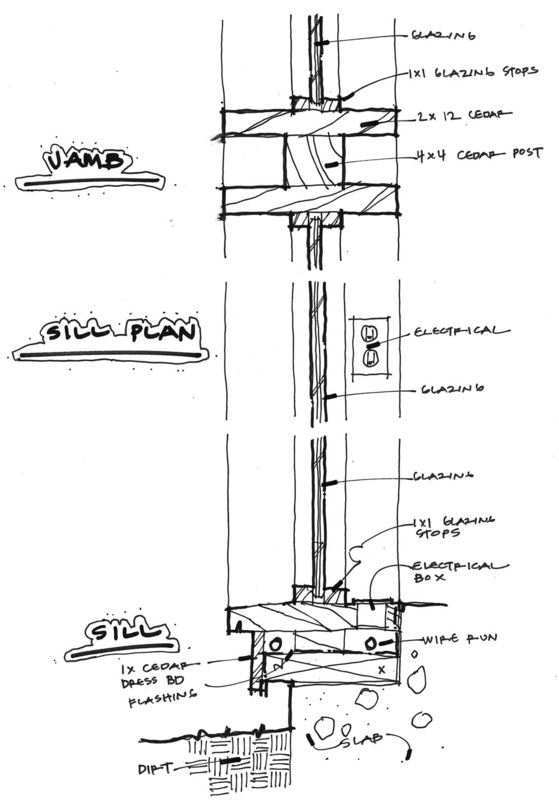 One of the reasons I decided to include it here is the extra 1″ of spacing that was created at the slab perimeter that allowed for a 1/2″ conduit run that allowed the electrical boxes to be set into the site built window sill. It is very slick and clever and a detail that I stuck in my arsenal for my own projects. The Modern House Challenge may be moving along slowing but it is moving along. It is only a matter to time before all these little pieces come together in a collection of clever cost effective details and products. Instead of jumping straight into the fun bits – designing massing and programming, plans and sections, I think approaching it in the beginning as getting all the information together and exploring the pro’s and con’s each has to offer is the right way to develop this idea.